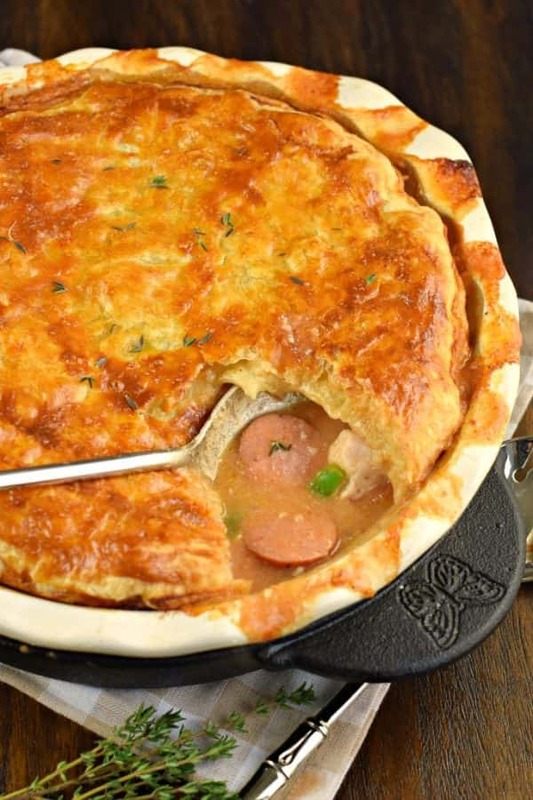 Chicken and Sausage Jambalaya Pot Pie. 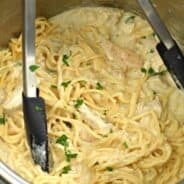 Give this easy, cajun dinner recipe a try tonight! My husband and I celebrated our 22nd anniversary this past weekend. TWENTY TWO years. For 22 years I’ve been the cook. The recipe developer. The one who chooses 90% of our dinners. So obviously, I tend to make what I like (Italian Beef Ring). What I’m comfortable with (Baked Margherita Chicken). And what I grew up on (Sausage Stuffed Shells)! And in those twenty two years I have never made him Jambalaya. Poor guy could live off cajun food, and I never think to make it myself. Until now. I saw this recipe for Jambalaya Pot Pie from Foodness Gracious and KNEW that had to change. 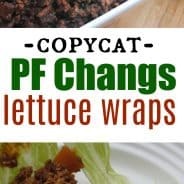 Gerry made the most perfect recipe, and I promised my husband I’ll be making it again and again! 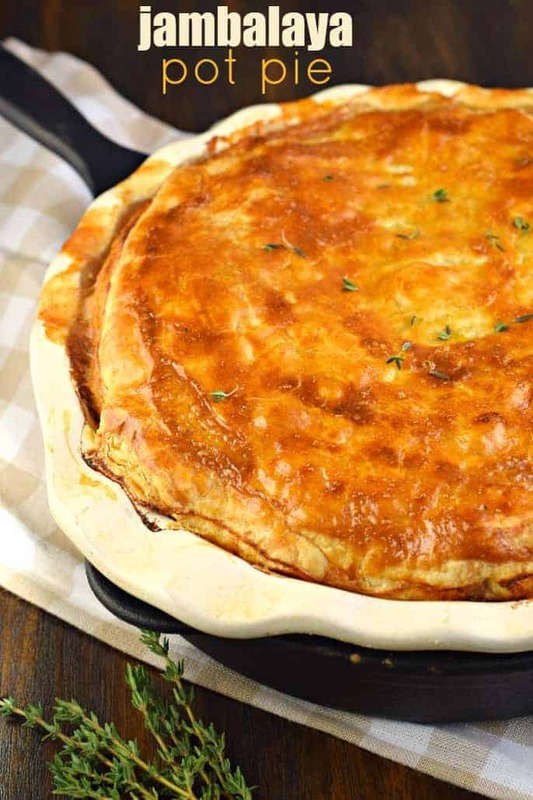 From the flaky crust to the spicy, cajun filling, this pot pie is a tasty keeper! 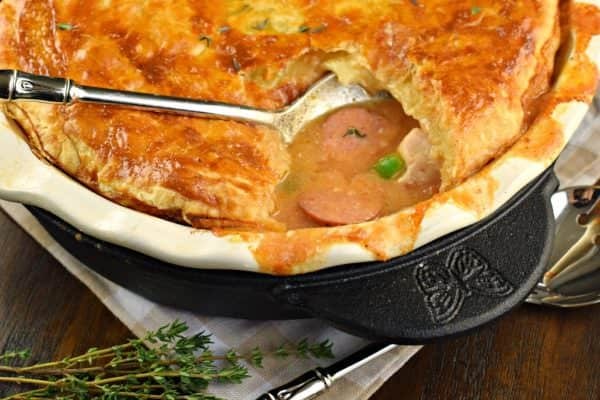 For a traditional pot pie recipe, check out this delicious Chicken Pot Pie. 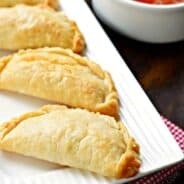 You won’t be disappointed in the hearty chicken and vegetable filling topped with a flaky, buttery pie crust! Preheat oven to 400° F. You will need a 10 x 2-inch deep pie dish or cast iron skillet. In a large pan, heat olive oil and add the cubed chicken, sausage, onion, and garlic. Cook on medium-high heat until the chicken is browned on all sides (does not need to be fully cooked). Remove chicken and place in a large bowl. Set aside. Place the large pan back on low heat to melt the butter. Add the flour and whisk with the melted butter for about 3-4 minutes. Turn the heat up to medium and slowly add the chicken stock, whisking the entire time you add it. Slowly add in the heavy cream and bring to a simmer, still whisking. Add the thyme, cayenne, creole, and onion powder seasonings and whisk for about 4-5 more minutes turning down the heat if it starts to bubble too much. Stir in the diced green peppers and tomato and then add the meat mixture that was set aside at the beginning. Transfer everything to your pie dish (or cast iron skillet) and spread it out evenly. Unfold your thawed puff pastry and lay it over the top of the filling. Carefully tuck the edges in around the dish. Using a pastry brush, glaze the puff pastry with the beaten egg. 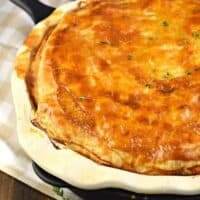 Place the pot pie into the oven and bake for about 40 minutes until the pastry turns a golden brown and the filling starts to bubble around the edges of the pie dish. Sprinkle with a little fresh thyme. Serve immediately! This is absolutely brilliant fusion!! I love jambalaya but I actually am not nuts about rice, so this really seems like a great solution for me (and my family)! What a deliciously awesome idea and such a sweet dish to make for your anniversary! My husband and I are about to celebrate 5 years… Huge congrats on 22!! Awww, congrats on 5 years!!! This is such a clever combination! Looks delicious!